Laos has two types of silkworms; the yellow that make a softer silk, and white that make a finer silk. Silkworms produce three distinctly separate layers of silk: the outer layer is roughest (mai peurk), the middle is medium (mai kang), and the part closest to the worm is the finest (mai nyod). These layers can be separated as the silk is unwound, or all combined for a "medium" or mixed silk (mai sao louan) thread. The medium silk is used most frequently in Laos weaving. Raising the silkworms is an art in itself. See Patricia Cheesman's book (in recommended books) for a detailed description of the process. Once raised, the silk is unwound from the cocoon by boiling it to loosen the individual threads. The silk threads are unwound by pulling them out of the water using a stick, and reeling them over a small wheel that gives the threads a slight twist before being gathered in a basket. The size of the thread is determined by the number of strands of silk twisted together. Before weaving, the silk is boiled in a lye solutions to eliminate the gum seracin that coats the silk from the cocoon forming process, and which makes the silk stiff. The silk is then rinsed clean and hung to dry in preparation for dying. For further interesting facts on silk, see The Story of Lao Silk in our fourth newsletter. 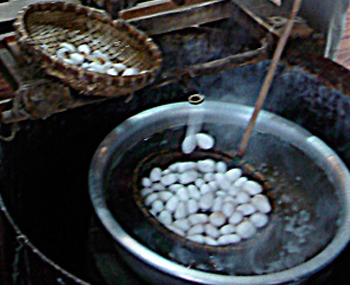 Silk worms boiling to loosen the seracin gum holding it together. 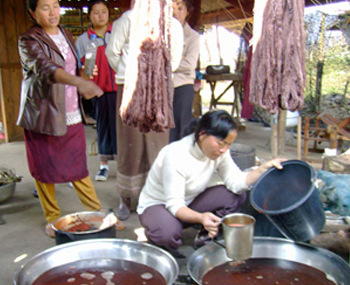 Women dying silk in mulberry dye for a rich burgundy color. Cotton is grown in the lower elevations of Laos and Vietnam and used by mosthill tribe peoples for their daily clothing and household textiles. The seeds are removed with a hand-made and operated gin, carded by hand, and spun on a wheel made so the spinner can sit on the ground to operate it. The cotton is bleached by boiling it in lye and drying it in the sun. 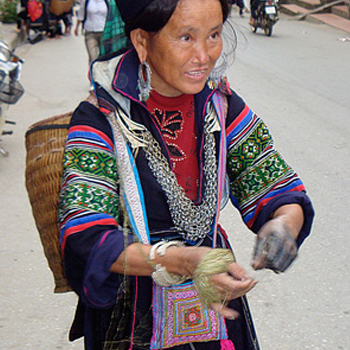 Hemp is used primarily by the Hmong peoples. The plant grows in the summer, is harvested in the fall, and all winter long the women separate and spin the hemp fiber for weaving. In Sapa, Vietnam, we saw girls and women spinning using a drop spindle whenever they were not using their hands for something else. They spun while walking around town, selling other wares, and while walking back through the fields and hills to and from home. Hemp is a very strong fiber, formerly used for making sailing ropes and clothing in the US and Europe. As such, it makes strong and flexible clothing, able to withstand daily use in mountainous regions. Harvested hemp waiting to be peeled for weaving. Sho's mom twisting hemp strands into one long string for weaving. 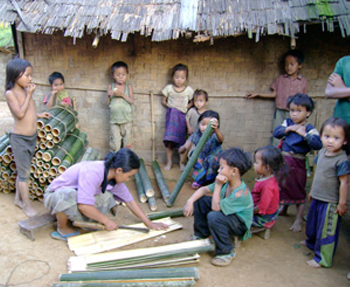 Bamboo is a staple need of the people who live in the mountainous jungles of Laos and Vietnam. It grows naturally and quickly in the wild, and is rigorously harvested both for daily village needs and for export. Bamboo has some unique properties that makes it vital: it is lighter in density than a bird but is as strong as steel (withstanding up to 52000 psi), has a higher compressive strength than many mixtures of concrete, and can grow up to 4 feet (1.2 meters) per day. Also, it is plentiful, requires no cultivation, and can be harvested every 3 years without damaging the plant system or the surrounding environment (its roots help hold soil on steep hillsides). It is pliable, straight, and resistant to rot; there are many examples of buildings constructed entirely of bamboo, some of which are now several hundred years old. Many species of bamboo are used extensively in village life: it is the wood used most often for floors, walls, and rafters; it is made into gutters, ladders, and floor mats; because it is hollow, it is used as a pipe to carry water to villages and fields; its early shoots are large, delicious, and a very healthy food; it can be burned for fuel, processed to make paper, designed as bird and fish traps, and fed to animals. 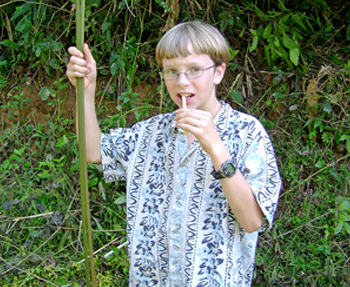 It is also one of the two primary plants used for essential basket weaving. Since green bamboo is very supple, it can be woven into almost any shape. Village craftsmen (and the basket-weavers are primarily men) split the bamboo, soak the strips, and then weave a wide variety of basket styles and sizes which are used for carrying or storage purposes. Bamboo baskets often incorporate rattan strips to help bind the basket together, and many baskets have frames and pieces of wood for added rigidity. The baskets are finally smoked above the hearth fire to increase bug resistance. Woman in Khamu village splitting bamboo for use as roofing or for weaving. 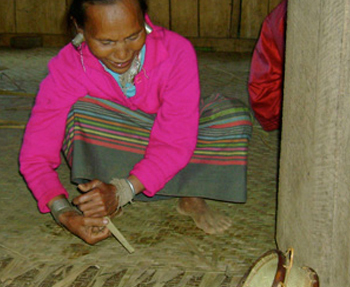 WKwi woman weaving bamboo into a mat, with the basket she wove of bamboo and rattan in front. Unlike bamboo, rattan climbs like a vine, but it shares similar qualities in that it is strong and uniform. Because of its greater flexibility and its very long stems, rattan is a primary binding material. In unsplit form, it is used like rope for tying up livestock, securing boats, constructing bridges, holding axe-heads in place, and binding the structural beams and slats of houses. Once split, rattan is woven into many necessary household and agricultural items. For household use, split strips of the shiny material are woven into sleeping mats and baskets of all sizes and shapes. Some baskets are woven so tightly that they can be used to haul water. Rattan's very flexible nature allows it to be tightly woven into knots and bent around sharp corners. It is an vital natural resource in the traditionalhill tribe village. Raw rattan grows best in "secondary" rain forests, where the trees are fairly young and a lot of light penetrates to the forest floor. Rattan is a creeping plant that closely resembles the stem of a rose. It grows from the forest floor, using the trees to climb upward, and is typically harvested by the rattan farmers when it is several years old. While primarily used as binding material and for basket-making in the village, its inner core, when fresh, is edible and delicious. Like bamboo, rattan is harvested one machete chop at a time. Villagers then strip the rattan of its thorny outer layer and peel out the core rattan. To prepare it, the rattan is first washed in water which helps strip away the layer of silica that coats the core rattan. The next step is to cure the rattan by intensely smoking it for a few days. 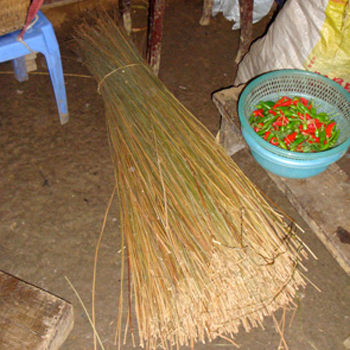 After curing, the rattan has to be dried to remove excess moisture. This is done outside under the hot sun, and takes perhaps another two or three days. After drying, the pliable rattan is ready for use. Rattan can further be processed into peeled strips for weaving into strong carrying or storage baskets. It is often used together with bamboo strips in order to make a basket even stronger and more durable. Once a basket is woven, it is smoked above the household hearth for up to a year – this treats the rattan to make it more resilient and resistant to breakage and bugs. It also assures the basket a beautiful warm patina! Zall eating rattan insides (rather bitter!) while holding green shoots. 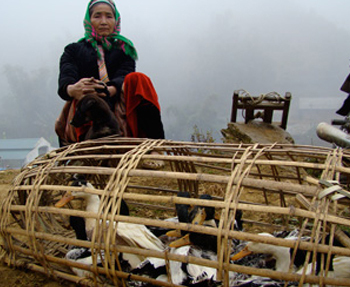 Flower Hmong woman waiting to sell her ducks kept in a crude rattan basket. Being "cash poor,"hill tribe cultures cannot purchase newly processed steel, aluminum, silver and other needed metals from world markets. Thus metals are obtained primarily through recycling. Ironically, most of the desired steel and aluminum comes from recycling materials left from the wars fought with the French in the 1950's and the Americans and Chinese in the 1960-70's. Aluminum from aircraft parts and steel from bomb casings, shrapnel, and abandoned equipment such as tanks are readily collected, smelted, and shaped into plows, shovels, axe blades, nails, kitchen pots and cutlery, and even personal adornments such as head-dresses, earrings, and necklaces. Silver for dowry-quality jewelry is usually obtained from old French ("Indo-Chinese") coinage used in the region during the first half of the 20th Century. The village metal-worker is a revered artisan needed for making, repairing and re-sharpening essentials; we often see the smoke for the smelting pot and hear the "oom-pha" of the billows in the villages we visit. 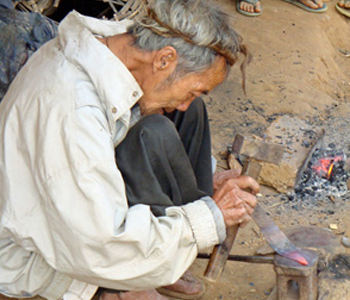 Hmong elder and blacksmith forging a knife blade. 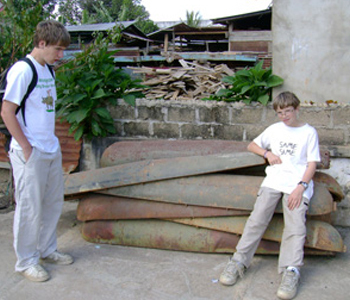 Ari and Zall with bomb casings ready for recycling.